Your iPhone can be a cell phone, an mp3 player, an alarm clock, and a myriad of other such useful tools. Now, you can add digital photoframe and birthday reminder to that long list, for that is what David Pejinovic’s iPhone app, Dock Suite, brings to the table. Upon launch, you can see for yourself the basic interface of Dock Suite, which manages to integrate all three major aspects–photoframe, alarm clock, and birthday reminder–in a clean and sleek manner (it doesn’t hurt that the five sample photos they’ve preloaded are gorgeous shots). After you’re done admiring the transitioning photos, tap the screen to bring up toolbar at the top of the screen. You can adjust the screen’s brightness or tap the Menu button to start changing your settings. Display Settings will allow you to show or hide things on the main photoframe screen: birthday and alarm buttons, the entire clock interface, and the battery status. In Photo Frame Settings, you can change transition types and the timing of both the transitions and how long the photo stays on the screen; it is also here that you can override the iPhone’s auto-lock, so that the photoframe is always on. 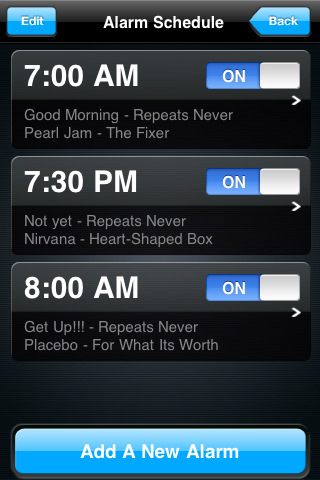 The alarm schedule is accessible through both the main screen and the Alarm Schedule tab in the Menu. In creating a new alarm, you have a choice between five preset sounds, or you can pick a song from your iPod library, if the preset sounds don’t suffice. There are also options a Gentle Wake (increasing alarm volume) and vibration (works only in an iPhone). Turn on the Snooze if you’re the type to fall back asleep! Add as many alarms as you want. The Slideshow Manager is where you can add or delete photos from your photostream (the app will pull photos from your iPhone photo album). Each album can contain 32 photos, and you can create as many slideshows as you want. Lastly, the birthday reminder doesn’t have a place in Settings, but directly pulls the information from your iPhone Contacts list. Tapping on the Birthday button in the main screen will take you to the entire list of birthdays. In terms of aesthetics, Dock Suite is hard to resist, especially with the huge amount of customization possible. Its layout is very simple, which you can make even simpler by turning the whole clock interface off. Depending on how you made up your albums, your photostreams can have different themes (only one album can be enabled at a time). You can even display the photoframe in different orientations, including upside down. The birthday reminder is useful if you don’t check social networking sites (like Facebook) often and bother to enter all your contacts’ birthdates–you’ll never be late for birthday well-wishes again. Unfortunately, the huge downside to all this is that you’re pretty much tied down to a dock in order to enjoy the app to its fullest. Having the auto-lock disabled on a photoframe is a huge battery drain, and the alarm sounds aren’t nearly loud enough to wake somebody before they want to be woken. Dock Suite is exquisitely crafted and unexpensive at $0.99, but also not very effective without some connection to a power source with speakers. AppSafari review of Dock Suite was written by Julie Guan on April 10th, 2010 and categorized under App Store, Contacts, Events, Photos, Utilities. Page viewed 4416 times, 4 so far today. Need help on using these apps? Please read the Help Page.